Thinking of opening a business downtown? We have two great resources for you. The first is a cheat sheet of the six primary offices you should visit and how each will help prepare you for business and/or building ownership. View and download. 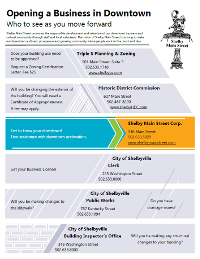 Second is a comprehensive guide for new, expanding and relocating businesses in Shelby County. Compiled and crafted by Shelby Main Street, Shelby County Chamber of Commerce and the Shelby County Industrial and Development Foundation, this guide is filled with the pertinent details needed to help you succeed. View and download.